This elegant-yet-demure Georgian-style building with some hints of Art Deco was, for many years, home to publisher Conde Nast, who hosted legendary parties in its custom-designed penthouse high above the Upper East Side. Another unique detail: The 1925 building's three-story limestone base is topped by a tortoise-and-hare frieze that has been adopted by the American Association for the Advancement and Appreciation of Animals in Art & Architecture. The 14-floor co-op residence offers a full-time doorman, central air conditioning and a fitness center. Its prime Carnegie Hill location is near the Metropolitan Museum of Art and other museums as well as the restaurants, boutiques and art galleries of Madison Avenue and everything the Upper East Side has to offer. Purchase application completed and signed (enclosed). Please complete Notice of Intention to Sell Condominium Unit (enclosed). Notice to the Board of Managers of 515 Park Avenue Condominium c/o Douglas Elliman Property Management stating that you have received a bona fide offer to purchaser your unit. Said notice must include the name and address of the party making the offer to purchase your unit, and the terms of the proposed transaction. The giving of such notice to the Board shall constitute an offer by you to sell your unit to the Board or its designee. Upon the same terms and conditions as contained in the proposed contract and shall also constitute a warranty and representation by you that you believe the offer to sell your unit to be bona fide in all respects. Contract of Sale executed by all parties. Contract must contain the following language: This agreement and the rights and obligations of the parties hereunder are hereby made expressly subject to the rights if any, of the condominium Board of the Condominium with respect to the transaction embodied herein pursuant to the terms of sections 7.5 and 7.9 of the By-Laws of the Condominium, as the same may have been amended. Please complete Occupancy Statement/Contact Form (enclosed). Notice of Intention to Lease (enclosed). 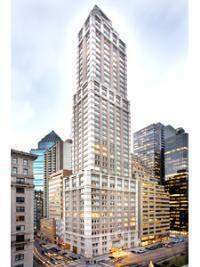 Notice to the Board of Managers of 515 Park Avenue Condominium c/o Douglas Elliman Property Management stating that you have received a bona fide offer to lease your unit. Said notice must include the name and address of the party making the offer to lease your unit, and the terms of the proposed transaction. The giving of such notice to the Board shall constitute an offer by you to lease your unit to the Board or its designee. Upon the same terms and conditions as contained in the proposed lease agreement and shall also constitute a warranty and representation by you that you believe the offer to lease your unit to be bona fide in all respects. Fully executed Lease Agreement (enclosed). All Lease Agreements must contain the following language: This agreement and the rights and obligations of the parties hereunder are hereby made expressly subject to the rights if any, of the condominium Board of the Condominium with respect to the transaction embodied herein pursuant to the terms of sections 7.5 and 7.9 of the By-Laws of the Condominium, as the same may have been amended. Please complete Lease Application for Waiver of Right of First Refusal (enclosed) and Financial Statement (enclosed).